Testicular cancer may be one of the least-talked about cancers, but it is actually the most common cancer among men. This alone makes it worth conversing about. In the United States, an estimated 161,360 men are diagnosed with prostate cancer each year. While the survival rate is higher than most cancers (the 5-year rate for most men with local or regional cancer of the prostate is 100%; 10-year rate is 98%), there are no guarantees when dealing with the affliction, as the sickness stems from toxicity, acidosis and a backed up lymphatic system. If ignored, the root cause of the disease may manifest into more. Tom with one of his children in the garden. “I literally did everything imaginable to heal my entire life. The first thing I did was to completely eliminate all fast food, junk food, fake food and anything processed,” said Arguello. “I consumed over a liter of raw, homemade green juice every day without fail and began to eat clean, scratch-made meals. I also drank a ton of alkaline water and low-sugar kombucha along with several tablespoons of apple cider vinegar per day. Essentially, everything I ate (or drank) was a superfood, but I would specifically cite turmeric and moringa as superfoods that I consumed regularly.” He also began running outside, as there are numerous benefits to obtaining enough vitamin D and oxygenating your cells. It makes “it harder for cancer to thrive,” he said. An important part of the process was understanding that he alone was responsible for creating the cancer. As a result, he chose to give up phrases such as “fight cancer” and “battle cancer,” because he was mentally done being in a war with his body. “Words have power and energy. When you think or say low vibrational thoughts and words, you are essentially working out a negativity muscle. Do you really want that muscle to grow?” said Arguello. Fortunately, Arguello’s experience has rippled out and positively affected others. 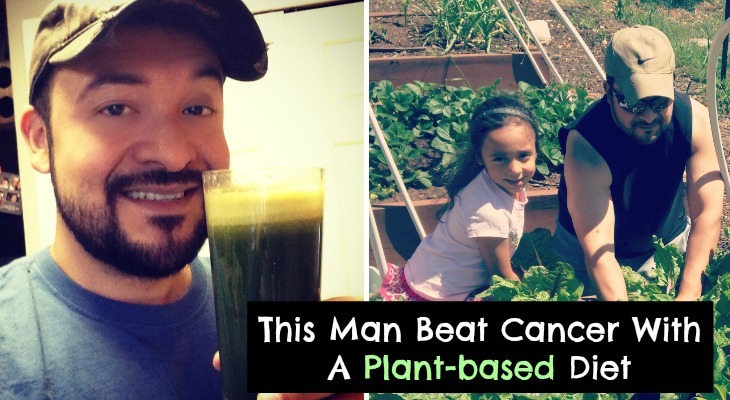 Not only does his family regularly consume juice and healthy meals, too, his wife introduced scratch-made, unprocessed, organic food at the childcare center she runs. There, a 500 square-foot garden space is teaching children about the importance of healthy eating and connecting with the Earth. Arguello’s journey is inspiring and motivating for those who seek to better their lives through a healthy diet and a positive mentality. You can learn more by visiting The Green Health Project Facebook and Instagram, as well as the LilyPad Gardens School Facebook and Instagram. Check out his new project, the Talking Shift Podcast.